Starting at the base of your pot, lay down a stream of hot glue and press the rope or cord down firmly into it. Continue wrapping around the base of the pot, working upwards until you reach the top. In the second or third row up from the bottom, glue the cording into evenly spaced "bumps". The next time around the "bumps" will grow larger. 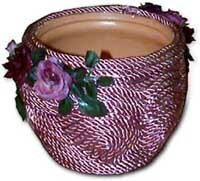 By the time you reach the top of the pot you may need to fill in extra spaces with small coils of cord. 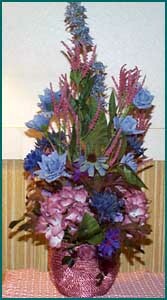 Added decoration such as silk flowers or beads can be glued on as you like.